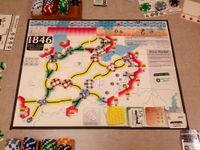 1846 is a fantastic introductory game in the 18xx family, but it isn't readily available without a long wait. While my order is working its way through the queue at Deep Thought GamesDeep Thought Games, I decided to try my hand at making it from scratch. The art style was influenced by my recent experience PnP-ing Carthiganian's redesign of 1800. Most of the components were made by gluing two sheets of 67 pound cardstock back-to-back and then applying 3mil laminate before cutting. I borrowed (and wore out) my wife's corner rounding punch to put the final polish on the rectangular cards and company charters. Read on and I'll talk a bit about each component and how I chose the look and feel for each compared to the published game. 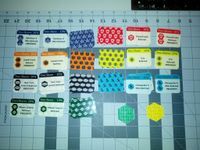 Station Tokens: These use the logos of real historical rail companies, so I didn't change them much. I did invert the colors for the Illinois Central, so that every token would have more color than not. I also made up logos for the Big 4 and Michigan Southern minor railroads rather than use plain text. 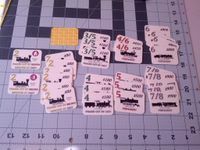 Trains: To me, the train cards in an 18xx game are just a boring set of 3 numbers - speed, cost, and rusting phase. So I asked a friend who actually cares about trains to suggest some historically appropriate locomotives. From his suggestions, I created line-drawings in Carthiganian's style. Company Charters: The only thing special here is that rather than cutting the mat in half and labeling one half 'trains' and one half 'treasury', as most 18xx games do, I just created a big clean 'assets' box with some text at the bottom for the railroads with special abilities. 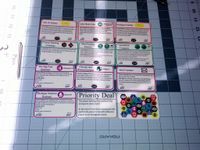 Private Companies: I tried to make the private company cards look like itty-bitty company charters, although they obviously have more rules text per square inch. These are 1/4 the size of the major company mats. Shares: I wanted to make shares that were more colorful than not, but not too distracting. The faded company logo background gives a nice watermarked look, I think. The logo on the left and the % on the top means players can fan out their shares several ways on the table and still see all the relevant information at once. Track: The track went through more trial-and-error than any other part of my design. In the end I settled on this style that fades to the board color as it gets farther from the track. 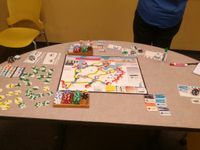 I think it really draws the eye to the most important information - what color is the track and what does it connect, in a way that my first few designs didn't quite achieve, while still being very pleasing to the eye. Board: The board is the one part of the game I where made non-artistic tweaks. 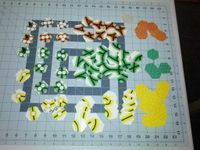 In the published version, terrain costs are printed as a replacement for the normal $20 track costs, as you can see here I instead printed them as an increase instead. The other change I made relates to the Harbor and Meat-Packing factory bonuses. Rather than $20 per anchor icon, with multiple anchor icons at some ports, I printed the numerical value next to the anchor. I also placed the factory and harbor bonuses just outside of cities on the board, so that they would remain visible when the hex is covered over by track. 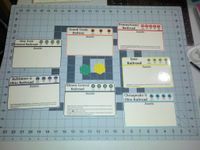 The board is made by mounting four sheets of the same cardstock onto four peices of artist board, taped together with book binding tape to produce a quad fold that I'm mostly happy with. There are gaps where the four pages meet that I could have eliminated if I had used a large-format printer instead. All things considered though, I couldn't be happier. Thanks for reading all the way to the end. I'll close with a few pictures from the first time I got it to the table. Great work. Thanks for posting this and your thoughts in it's creation. I'm not an anti-gradient guy but I do find your tracks to be very distracting. Glad it works for you though. 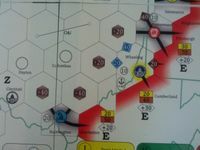 I just played a game of 1846: The Race for the Midwest last night on Mike's PnP set. It was the first time I played the game on anything other than a set using the standard DTG graphics presentation. Once we started I didn't even think about the fact that we were playing on a set with different graphics from the ones I am used to. So, for me, any concerns about the graphics being hard to follow were not justified. 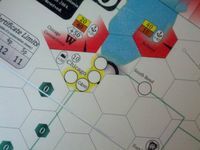 It was my 128th game of 1846: The Race for the Midwest, so it's possible that I've internalized enough about the game that the graphics are less important to me than they would be to someone who hasn't played it as often. However, I was expecting to at least notice the differences, and I didn't. I take that as pretty high praise, thank you Eric. Though in the interest of fairness, I should note that we did identify an important typo in my version of the Mail Contract card as a result of your scrutiny. Thanks for joining us for the game, I had a lot of fun.